Blogs are a huge online resource of knowledge that can help you learn almost everything about any given industry or field of work. The design is by no means different as it offers a plethora of incredible blogs that surprise and inspire followers with the sheer power of their creativity. But blogging is not easy. A study reveals that almost 70% of authors worry about the lack of traffic and readers. It’s just too difficult for most bloggers to keep finding relevant topics week after week while still maintaining the top-notch writing quality. If you are running a design-related blog, you should follow some of the most popular sites to monitor the latest industry trends, analyze how they write, and see what they believe is important. This post will present you four best design blogs to follow to get an everyday writing inspiration. Before we start talking about the most impressive design-focused blogs, we need to answer two questions: why people write online and what makes a great blog. The answer to the first question is easy. Blogging has the purpose to raise awareness, build your online authority, and generate new business leads. That’s exactly why marketers who prioritize blogging are 13 times more likely to achieve a positive return on investments on their efforts. Precisely defined target audience: You need to know the traits of your average followers – where they live, what they do for a living, academic background, income level, values they share, etc. SEO optimization: Blog success depends largely on the SEO tactic you realize. Always conduct a keyword research prior to writing posts, and don’t forget to optimize each segment of a blog page, from headlines to URLs. Attractive titles: Most followers decide whether to read articles or not based on the headline alone, so make sure to come up with the most attractive solution every time. Long form: Modern readers don’t like short and vague posts. On the contrary, they prefer longer formats that analyze subjects from all angles. Readability: It’s impossible to attract the target audience with poorly-structured texts. You need to pay attention to the article structure, using numbers, bulletins, subheadings, and other elements that allow easier scanning. Actionable: A blog visitor must be able to take concrete steps after reading your posts. If you can achieve that, it means you wrote an actionable and very practical article. Style: The best bloggers develop their own style of writing. That way, they build professional credibility, while regular readers can recognize their posts easily. CTA: Each blog should have a concrete purpose because you want to convince readers to engage even further. Always include calls to action to ensure more user engagement. 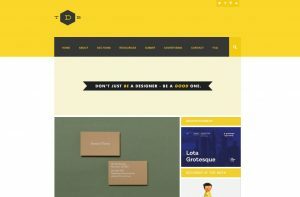 The Design Blog is an all-encompassing industry resource launched with the purpose to help people become good designers. Founded in 2011 by the Zagreb-born Ena Bacanovic, the blog quickly became one of the most popular design sites globally. It puts a particular emphasis on young designers and students who are eager to learn important industry tricks. The Design Blog is filled with interesting sections that ensure simple navigation. You can find a wide range of topics, including app design, animations, advertising, art, branding, crafts, fashion, fonts, digital design, illustrations, typography, user experience, identity, logo, stationery design, and many more. Each of these sections includes dozens of quality posts backed up by the eye-pleasing imagery. Besides that, The Design Blog makes a weekly schedule to help followers understand website concept and search for topics they need. Each day adds something new to the blog, but altogether it forms a meaningful set of design topics. For instance, they publish featured videos and quotes of the week on Monday, while Thursday brings you an overview of the best apps. There is also the “Resources” section which shows you a comprehensive list of online tools and libraries. You can explore it to find some of the best digital resources of design ideas, typography tools, free visuals, tutorials, freebies, and other useful apps. If you are looking for a blog that covers every design-related issue in dozens of different industries, Digital Arts might as well be the perfect website for you. First of all, it has a very useful “News” section with up to date articles concerning animation, printing, software development, video, interactive design, etc. The “Features” department contains appealing articles with tons of images and animations. If you need a more general industry introduction, you can skip to the “Guides” section that covers topics such as animations, creative hardware and software, graphics design and branding, illustrations and art, photography, and many more. Another feature we love about Digital Arts is the “Jobs” department. Just enter a desired position in the search box or scroll down to see the job openings currently available. You can find a lot of vacancy announcements from companies searching for Visual Designers, Junior Website Assistants, Senior UI Designers, etc. You don’t have to read strictly design-focused blogs in order to find a source of professional inspiration. On the contrary, there are blogs such as Trandland which give followers a wonderful overview of the hottest topics in design and other similar areas of work and life. Each one of these sections is flooded with amazing blog posts that describe topics from different points of view, while beautiful images support the story and make it more credible. What is even more impressive is the fact that Trandland publishes articles about news and reviews from all over the world, thus giving you an overview of global industry trends. As a blog writer, you should seize the opportunity to learn more about design and the corresponding niches, while you can also find inspiration for fresh topics that will distinguish you from other authors. A group of designers, illustrators, coders, and makers founded the FFF blog in 2007 “to collect and share the best design work they came across.” After years of successful functioning, they upgraded the platform and turned it into the new blogging website entitled Made by Folk. What they do is basically monitoring the latest industry breakthroughs and then inviting project authors to join the team and get involved through the blog. What does it mean for you as a blogger? It means that you are always standing in the frontline of your niche, receiving valuable information faster than your counterparts. You can find blog posts in the “Features” category, but Made by Folk is doing much more than just writing. Following state of the art digital trends, they also create audio and video content to ensure quality user experience across multiple channels. Made by Folk also publishes event announcements to help users find a place to meet fellow designers, developers, and industry thought leaders. There is also an online shop where you can buy some of the most creative examples of prints, illustrations, photos, type prints, and other similar items. Of course, you can learn about new posts from Made by Folk simply by following their social media accounts. Writing a design-focused blog can be highly beneficial for your business in general, but only if you reach the topmost level of creativity and proficiency. You also need to keep finding compelling article ideas, thus providing followers with fresh content week after week. In this post, we showed you four best design blogs to follow to get an everyday writing inspiration. Did you already follow any of these authors? Do you have other interesting design blogs to recommend? Feel free to let us know in comments – we will be glad to see your opinion about this topic!